Under the direction of Artistic Director, Jorge Laico, the audience will delight in dazzling all new choreography, spectacular sets and costumes, graceful dancers, and the timeless music of Tchaikovsky performed live by the Heartland Festival Orchestra. The cast of over 100 Peoria Ballet dancers will be joined by principle artists from The Joffrey Ballet dancing the roles of Sugar Plum Fairy and Cavalier. Winner of Peoria Magazines’ Best Theater Production award in 2017, this family holiday tradition is a treat for audiences of all ages. When purchasing tickets online, please be sure you are on the official Peoria Civic Center or Ticketmaster sites. There are websites that appear to look like these official sites but are actually ticket re-sellers who charge higher ticket prices and fees. These performances are presented for the enrichment of area schools, homeschool groups, and senior groups. 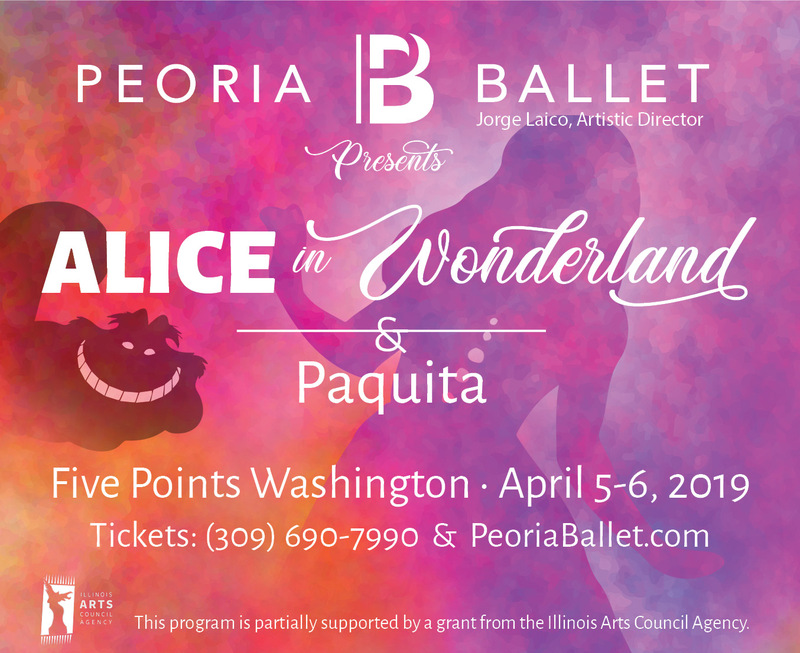 Peoria Ballet is excited to share the art of dance, while also engaging critical thinking and imagination skills through a live theatrical performance. Both productions will also provide excellent opportunities for cross-curricular studies in literature, history, art, and music. An educational study guide will be provided to teachers before the performances in order to provide resources and materials for enrichment purposes. In order to cover the cost of the theater, there is an admission fee of $5 per student, teacher, or chaperone. Students who qualify for “Free or Reduced” lunches pay only $2. If your entire school has been designated Title 1, please indicate that on the reservation form. Please see the school show letter for more information. Teachers and adult chaperones are invited to attend with their classes. Experience Lewis Carroll’s classic story transformed into a charming ballet. This family friendly adventure will transport you to a colorful fantasy world full of exhilarating fun! Plus, one of the ballet world’s all time classics – Paquita. Opulent gold and white sets and costumes create a stunning backdrop for this magnificent ballet. This production is perfect for families and children of all ages. Tickets are available starting March 2! Buy your tickets HERE or by calling Peoria Ballet at 309-690-7990 or visiting the studio at 809 W Detweiller Dr, Peoria. Meet and Greet – following the April 6th 1:30 pm performance. Children may get up close and personal with our our dancers and sit at the tea party table with Alice and her friends. Take pictures and chat with Alice and other cast members immediately following the performance. Our end of the academy year production where every student performs to demonstrate what was accomplished during the school year. Each class performs one piece featuring the skills learned during the year. Relax and enjoy an evening of dance under the stars. This outdoor festival in the park is the culmination of our 3-week Summer Intensive programming. Get up close and personal with Peoria Ballet students as they premiere their own original works plus additional pieces!